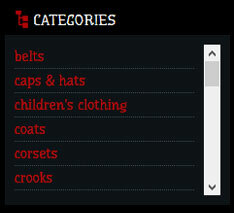 ↑ You may also choose to search with key words using the search window next to the tremendous Nosferatu logo. 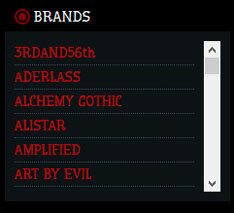 By clicking on the product in the list you will see the product detail. Sometimes, you'll have to choose the size or specific variant of the product - above the "To the cart" button - and then click it. This way you will add the product to the shopping cart. It will stay there until you select all of the products you wish to buy (or if you decide to cancel it). You can get back to the cart any time by clicking the number of items in the cart in the upper right corner. That way you get the product to the shopping cart - you may still continue shopping though (by clicking on other category, on the button CONTINUE SHOPPING etc. ), chosen products stay in the cart and you'll be able to see the sum of your purchase in british pounds in the upper right corner of the page. in the last step please carefully check if all of the information is correct, you may also add a note. *Registered users will have their adress filled in automatically. You may register here. Our goth shop is so deep underground that thus far you can pay only with Paypal.. All hail the Dark Lord .. although we are working on another methods of payment at this very moment. photo should be in some way original, well taken and express "something"
You don't have any claim to get your photos approved, everything is in control of the dark forces that we can't even begin to comprehend. Although the number of photos that got approved is getting higher, so something is definitely going on down there. HOW TO ADD YOUR PHOTO? Well that's simple enough! Everything you need to do is to find the particular product, click the "add photo" button and then you just find your chosen picture from your disk. 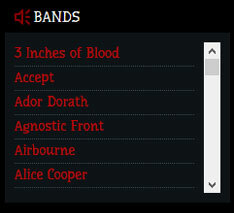 Approve of this choice by clicking upload and everything is done. The picture needs to have its sides in 4:3 or 3:4 ratio, so that it may be displayed always in the same way. Practically it means that its measurements must be in these multiples. e.g. longer side 400px to shorter one 300x; or 800px to 600px etc. A lot of cameras and phones already produce photos in the ratio mentioned above, but if you are having problems for whatever reason, try to use some of the free online software like Ifranview etc. Or you may ask some more experienced goth to help you. You are going to receive an email with reasoning whether your photo was actually approved or not. There is no point to argue and/or email back to us. All of those emails are going to get printed, soaked in sulphur and ritually destroyed. Please note, that rejected pictures are not archived by us in any way. You get to use your discount immediately after we email you that the dark forces approve of your picture. If you would like to see summary of all of the pictures you got approved, please just click on your nickname at the upper-right corner. After adding your products to the cart, simply choose which bonus would you like to use on that particular order and then continue to the payment. You'll see that the final price is automatically lowered.